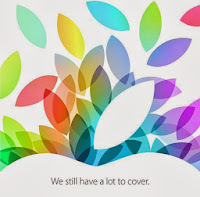 Apple has just confirmed October 22 as the date for the expected iPad and Mac special event. It was uite expected, but still feels exciting, as Apple still has new iPads for 2013 to launch, including the refreshed full sized iPad that should take on the look of the iPad mini. Moreover, A new iPad mini is also likely, though at this point it's still anyone’s guess as to whether it will or will not include a Retina Display. On the other hand, October 22 is also expected to bring news on the Mac front. OS X Mavericks is due for pending release, the already publicized Mac Pro should be getting some care, and we could be looking at a Haswell update for the MacBook Pro line too. The invitation spread officially demonstrated the colorful leaf shapes with the following sentence below: “We Still Have A Lot To Cover”! Whatever Apple covers in a week, we will keep you updated. Traditionally, the event will kick off at 10am PST and will be taking place at the Yerba Buena Center in San Francisco. When you are in town why not use one of the best pub crawl apps to really get the party started.